Pope welcomes first communist bishop !! BREAKING NEWS- Pope Francis opened a month-long worldwide meeting of Catholic bishops today, and the first session of the Synod began this afternoon. General sessions are expected to continue for about two weeks, after which time the members will meet in small groups divided by language. Those taking part in this Vatican charade include 50 cardinals, 145 bishops and archbishops, 37 auxiliary bishops, and ten priests and brothers from religious orders. Francis said today at the opening of the event that the bishops “should seek to enter into communion with the diverse situations that the People of God experience.” The October Synod is, in fact, also influenced by the arrival in Rome of two Chinese bishops, —one once excommunicated and nominated by the Chinese Communist party —to join in the Synod. 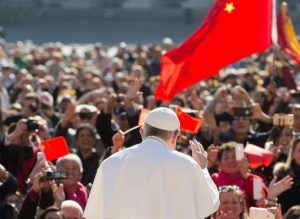 Under the recent deal with Communist China, Pope Francis recognized the legitimacy of seven bishops appointed by the Chinese government. These bishops were Communist and ex-communicated, therefore not selected by the Vatican, but that makes no difference to the Jesuit Pope. The two Chinese bishops are participating for the first time in history since the Synod process in 1967, thanks to the recent “provisional agreement” between the Vatican and Communist China that ended a decades-long dispute over the appointment of Catholic bishops, in one of the leading countries of the New World Order. During his homily, Francis mentioned the two bishops – Joseph Guo Jincai of Chengde and John Baptist Yang Xiao-ting of Yan’an, and said, “the communion of the entire episcopate with the Successor of Peter is yet more visible thanks to their presence”. 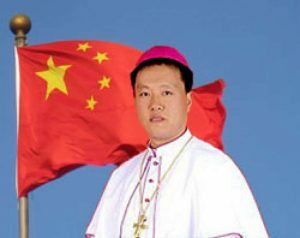 This statement is truly incredible as St.Peter was never a Communist, and well-informed sources are suggesting that Joseph Guo Jincai is actually an underground member of the Chinese Communist Party, and it would not be surprising if the Chinese Ministry of State Security, like the former Soviet KGB, had agents posing as priests at the top of their own hierarchy. He has been proven over and over again to be a willing accomplice to the Chinese Communist Party’s longstanding desire to create a schismatic church in China that answers not to Rome, but Beijing. This, after all, was the reason the Chinese Patriotic Catholic Association was set up in 1957. On November 20th, 2010, the Chinese Communist Party broke its tacit agreement with the Vatican to ordain bishops without papal approval. The outrage occurred in the county town of Pingquan in northern Hebei province, where Father Joseph Guo Jincai was installed as a Communist approved Bishop. Attempting to give a semblance of legitimacy to the illicit proceedings, the Chinese government went to great lengths in order to assemble as many bishops as possible to conduct this sham ordination for the state-run Chinese Patriotic Catholic Association now accepted by Pope Francis. Days before the event, a number of North Chinese bishops in communion with the uncompromising Pope Benedict XVI, were placed under house arrest, then taken by armed guards to the Pingquan church. The ordination took place under strong security, with dozens of police blocking the building and denying entrance to reporters, stated the Associated Press. At least three of the bishops had been sequestered by the government for several days to pressure them to participate. Eight bishops in the end were forced to lay their hands on Father Guo during the sham ordination arranged by the Chinese Communist Party, reported at the time by the Asian church news agency UCA News, with mental reservations one can only imagine! Others, like Bishop John Liu Jinghe of Tangshan, refused to attend despite the pressure, and was removed from his post by the government as a result. With regard to the episcopal ordination of the Reverend Joseph Guo Jincai, Ratzinger received the news with deep regret at the time, because the above-mentioned episcopal ordination was conferred without the apostolic mandate and, therefore, constitutes a painful wound upon ecclesial communion and a grave violation of Catholic discipline (cf. Letter of Benedict XVI to the Church in China, 2007, n. 9). Today, Pope Francis welcomed for the first time in history, a Communist nominated bishop with no legitimate Apostolic succession in the Synod of Bishops of the Catholic Church in Rome, giving us another sign of his Satanic rule that ignores the legitimacy of the true episcopal lineage. From now on, bishops of the Catholic Church can also trace their episcopal lineage to the Chinese Communist Party.